PepsiCo (NYSE:PEP) announced that it has entered into an agreement to acquire Bare Foods Co., maker of baked fruit and vegetable snacks. This acquisition is in-line with the company’s recent strategy of focusing on more nutritious products. As it adapts to changing consumer preferences, PepsiCo believes that healthier products will be key for long-term growth and the company is looking at several ways to make its portfolio of products healthier. According to the company, its “everyday nutrition” products will witness the fastest rate of sales growth by 2025. Bare Snacks, which began by selling packaged baked apple chips, has expanded to banana and coconut snacks, as well as into vegetable chips, which are baked, rather than fried. The brand’s products are Non-GMO Project verified, and are sold online and in natural and conventional retail channels across the country. While the terms of the deal were not disclosed, it was stated that Bare Snacks would continue to operate independently, with its leadership reporting to Frito-Lay North America. We have a $119 price estimate for PepsiCo, which is higher than the current market price. The charts have been made using our new, interactive platform. You can modify the different driver assumptions by clicking here for our interactive dashboard, to gauge their impact on the revenue, earnings, and price per share metrics. In order to meet the evolving needs of customers globally, PepsiCo is shifting its portfolio to a wider range termed as “Everyday Nutrition Products.” The company now derives approximately 45% of its revenues from these “Guilt Free Products” indicating that it has transformed its portfolio toward healthier products according to the new customer preferences. These products include “diet and other beverages that contain 70 calories or less from added sugar per 12-ounce serving and snacks with low levels of sodium and saturated fat” as well as “everyday nutrition products” – products with nutrients like grains, fruits and vegetables, protein, unsweetened tea, and water. These latter products constituted 28 points of the 45. With the growth of its beverage business slowing down, as a result of sluggish soda sales, the healthy products segment will be a focus for the company in the future to drive its sales. 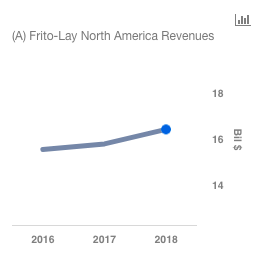 Frito-Lay is also pushing toward a premiumization of its products to fuel its revenue and margin growth. Consumers have been moving away from eating unhealthy products, which has put pressure on the volumes. Hence, by concentrating on premium brands, there can be a shift from low-priced, high-volume products to the high-priced, low-volume range, which may result in top and bottom line growth. The acquisition of Bare Foods fits perfectly with PepsiCo’s plan of focusing on its ‘Better For You’ portfolio. Moreover, it also provides the company with a line of products that are already doing well. Consequently, PepsiCo would not have to undertake the considerable investment needed to build the products from scratch, as well as the marketing dollars needed to establish a customer base. On the other hand, for Bare Foods, it could not have been a better offer. The brand gets to operate independently, while having access to PepsiCo’s immense distribution network, and vast coffers needed to increase production and the marketing of its products. While traditional and healthy snack categories are all reporting growth in the U.S., those with the non-GMO label are leading the pack, with an 18.2% surge in dollar sales for each of the past five years, according to Nielsen. Furthermore, Bare Snacks’ products are sold alongside fresh produce in grocery stores, and not in the crowded chips’ aisle, which gives them greater visibility to shoppers. These factors should ensure growth for the brand, and consequently, benefit PepsiCo in the years to come.